First thing is first: Get a cup of coffee!! These are the basic materials that you WILL need, everything else is optional. Next pick out any two colors of clay. 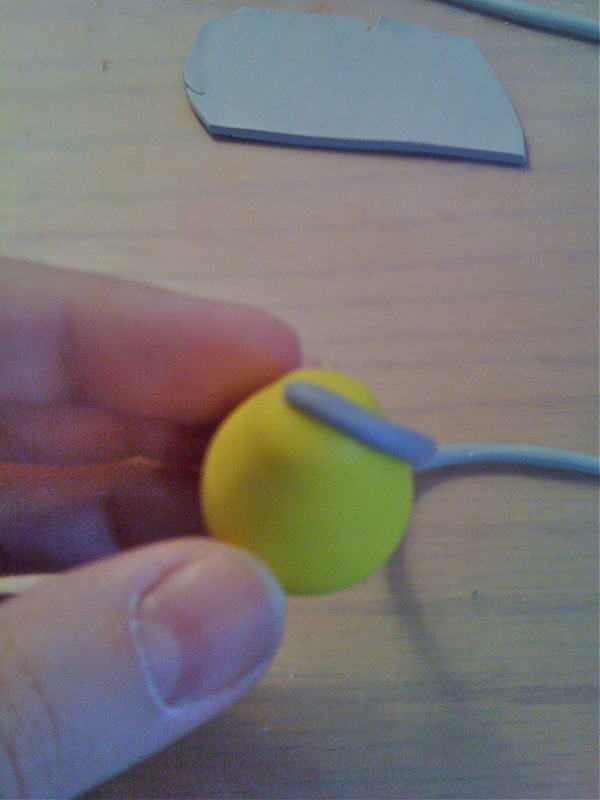 The bright color for the light bulb and the metallic color (or dark color) for the top of the bulb. You can do this many ways. I use a pasta machine as it’s the quickest. You can see that this clay is not conditioned enough. Though it’s now soft and pliable, it’s also flakey and falls apart easily. This clay is fully conditioned! It doesn’t flake anymore, it’s pliable, and it has a shimmery sheen to it. 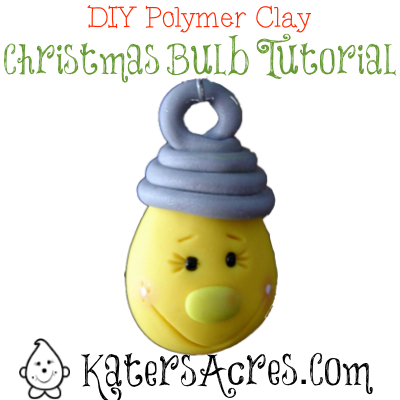 Take your “bulb” color of clay and form it into a pear shape. Next, roll a smaller ball of your second color. Take your second color ball and roll it into a thin snake. The snake does NOT have to be even. This adds to the whimsical look of the finished design. Add the snake to the bulb. Add a tiny drop of TLS to the top of the bulb. 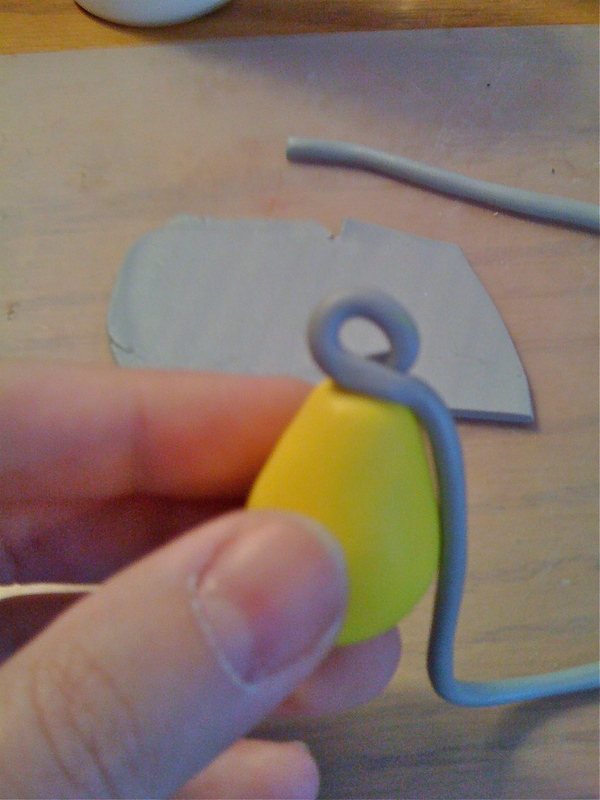 Make a loop on the top of the bulb with the clay. 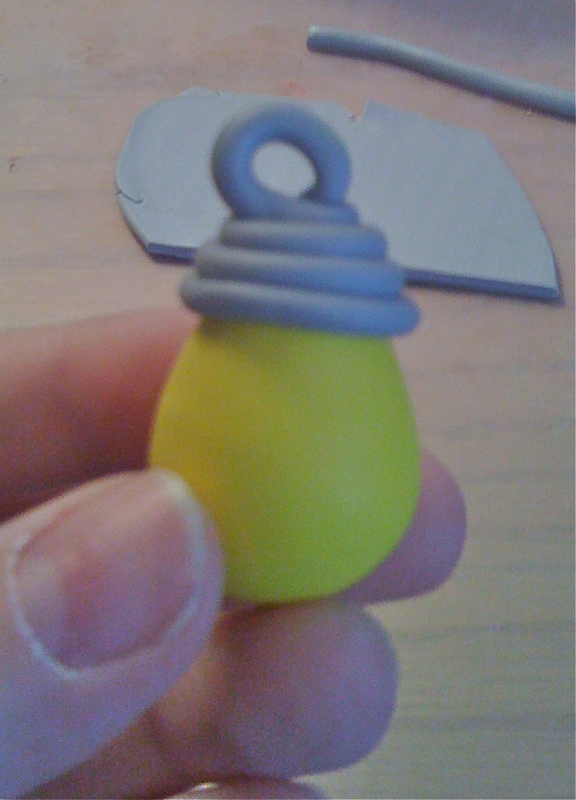 Then, wrap the clay around the top of the bulb to make the “light bulb” topper. Remember that you want each and every piece to be different…play around and have some fun. 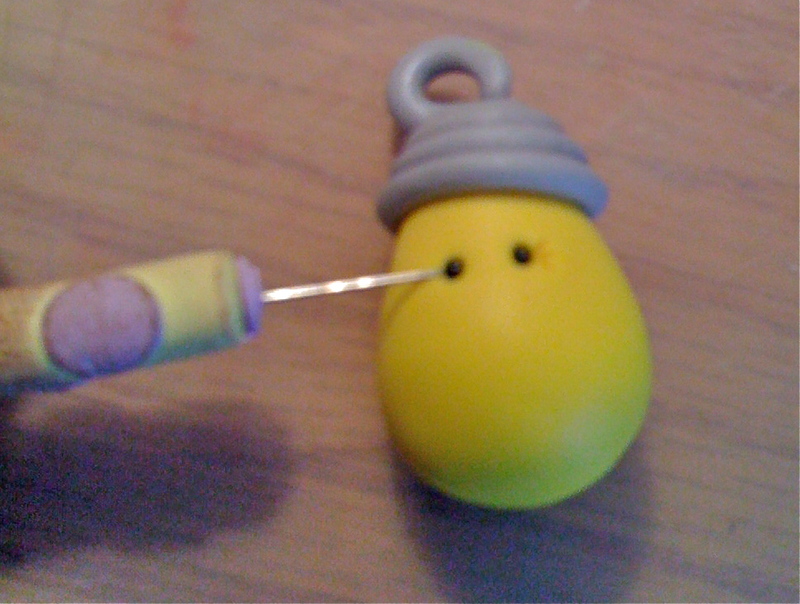 Here I have used seed beads for eyes and I put them on using my custom created needle tool. Add more details to personalize your bulb. Add a coordinating color of nose a few shades darker or lighter, or add a completely different color of nose, the choice is yours. 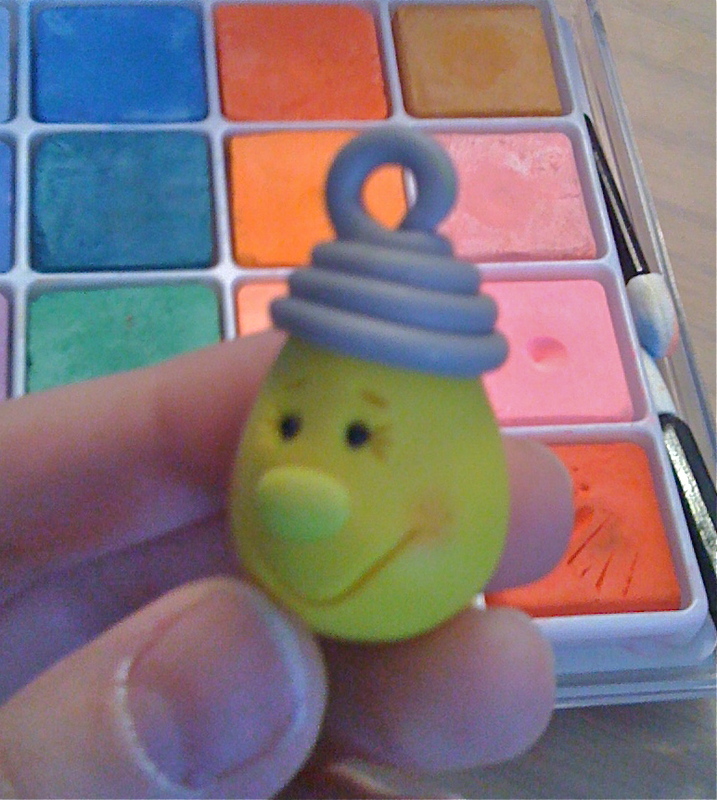 Now give the light bulb a big old smile (or a frown if he’s a grumpy lightbulb)! This step is optional. I like to add lots of details and color variations to my pieces that clay does not have on its own. Here I am using InkaDoo Artists Chalks. This set was approximately $20, but you can find cheaper ones with less colors. I generally use a soft paint brush to apply my colors. I chose a medium shade of pink to give this little cutie some rosy cheeks. Tip: Use gentle, simple strokes going over the same place multiple times until desired color is achieved. 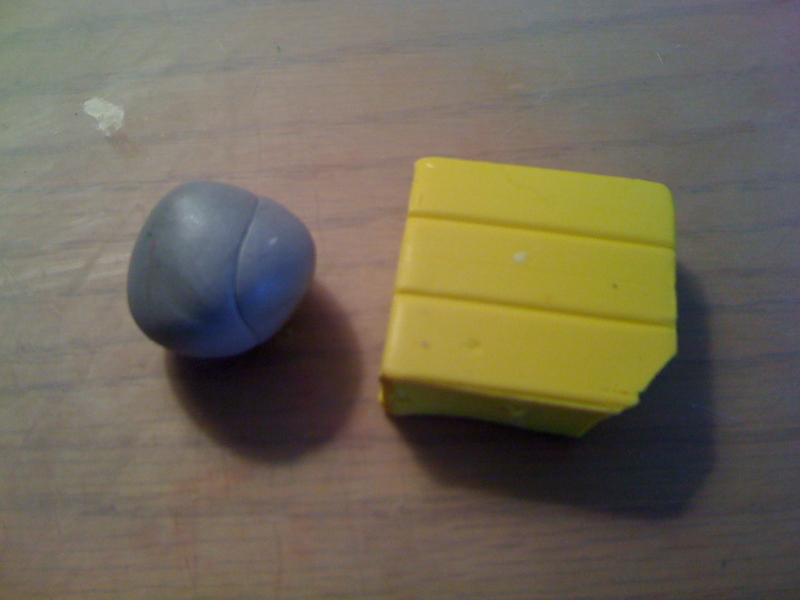 Start with a soft touch or the color may turn out too dark on your piece or worse, you’ll “dent” the clay…not good! Here’s the finished chalked piece. He has brighter yellow accents around his eyes and on his nose, as well as rosy cheeks. 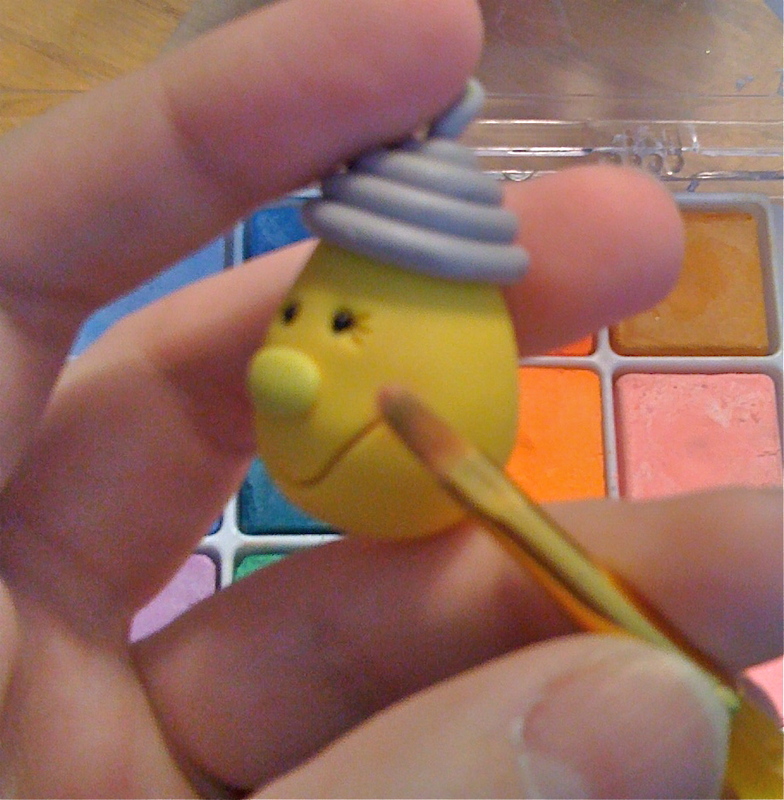 I also added pin dots near the cheeks for personality and glitter on his rosy cheeks to make them sparkle. (This was done after this picture was taken, see the final picture for full details). Here I’m getting ready for the next light bulb. To make more, just repeat the steps above, giving each piece its own character and its own personality. Remember NOT to make them all the same size or the same shape. Variation is important!!! Here’s my finished set of lightbulbs. These are “pre-glazing” condition. I will add white paint to certain parts of the bulbs, then glaze then ornament in its entirety so that it sparkles while on the tree. 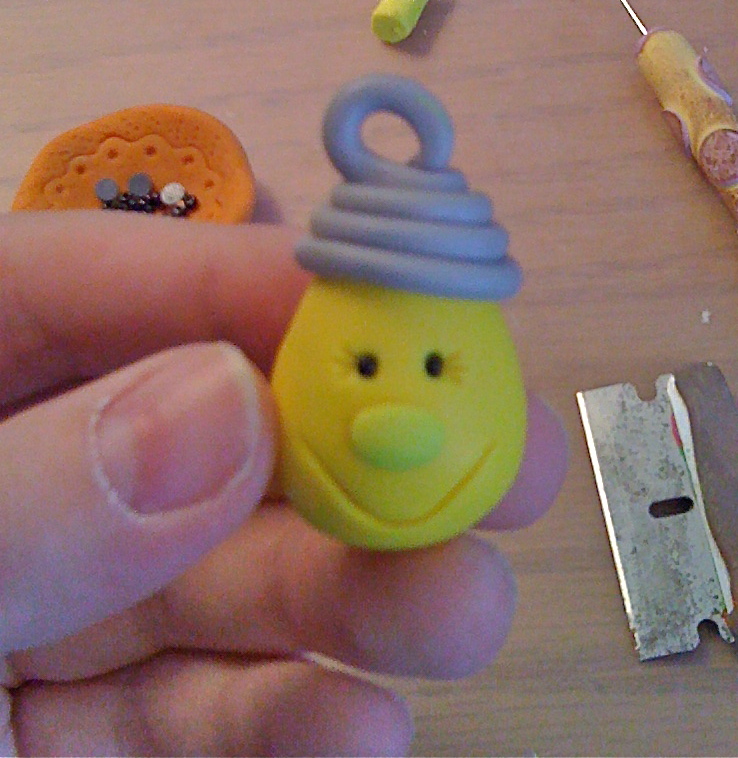 The best part about making something from polymer clay is that when you mess up….just squish it up and start over! I hope that you found this tutorial insightful! Comments, suggestions, or tips are always welcome! Loved these so much I had to make my own. They turned out great even the 1st time! Thank you so much. q* How do you keep the backs from ending up flat? I sanded mine, but am hoping you might have a tip?? You can place your ornaments on fiberfill and then bake them (instead of a tile). I just “set” my gently on the tile and end up with just a “spot” where they were against the tile, but mine didn’t have flat backs. Did you “squish” them onto the tile and then bake them? >Sandy – Thank you for stopping by. I'm glad that you like the lightbulb ornament. This was a really fun tutorial to photo, write, and post. Happy New Year! I love your little light bulb. He lights up without using any electricity. LOL Your tutorial is wonderful too. >PCAGOE – Thanks for stopping by. I have a heart for the fun & whimsical side of life. All of my clay things tend to reflect that. I'm glad that you liked the project. >Kath – Yes…if something is pre-baked, it must be painted. BUT before it's baked you can add the artist chalks. Be sure to seal it however after it's baked. >You do so many cute things with polymer. I didn't know you could color with chalk before baking. My youngest has been making gifts for friends this year again with polymer clay and figured she was going to have to paint. (which she still might because it's already been baked!) I'll have to share this with her. Thanks! >Thanks for the compliments everyone! I hope to write another one soon. >These are just precious…Thank you for sharing!! >Nice tutorial! and very nice lightbulbs! >Thanks for the great comments everyone! I REALLY liked writing this one. I might have to do it again! >Great tutorial, the ornaments are adorable. >Really cute ornaments! Good job and wish you the best! >Thanks Trina! The cup of coffee really is the most important step….everything else doesn't go right without it!